The woman likely to be the first female president of Brazil is headed to a runoff — in part because the vote was split by a third-party candidate, another woman. Is Brazil some sort of utopia of female leadership? Well, probably not. But they still have the U.S. beat — for all the talk of female ascendancy, at least on the Republican sides, the number of women in Congress is likely to fall in the midterm elections. That's already been true of Brazil's neighbors, Chile and Argentina, which elected female presidents within the past five years. That Rousseff, a technocrat who served as Lula's chief of staff, has been considered a sure thing is partly because she was handpicked by the outgoing president, usually known only as Lula, whose approval ratings are at 80 percent and who, The Guardian points out, halved the percentage of Brazilians living in poverty and helped lead Brazil into power and prosperity despite a global crisis. It appears that Rousseff has neither let her gender entirely define her campaign nor ignored it. 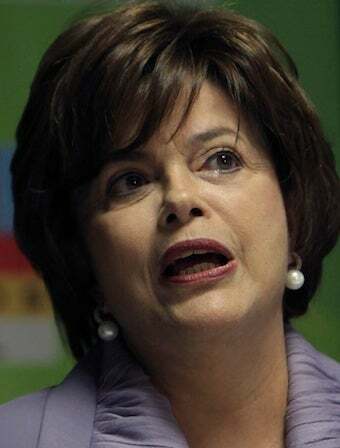 She has said, "Yes, it is possible for a woman to be the president of the republic," and that "women are ready to govern Brazil and more importantly Brazil is ready to be governed by a woman." She told The Guardian that women were "sensible, practical and sensitive... important qualities for someone who wants to govern a country." "The historic absence of women in politics has meant that society has been able to see in … [Rousseff] something that represents an advance, that represents a correction of Brazilian politics in terms of corruption, equality and the gender divide," she said. "I'm convinced that a great part of Dilma's success is down to her being a woman, and not just about the support of President Lula," she added. But when Lula went so far as to say that "Brazil will defeat machismo" if they elect Rousseff, she ratcheted it down a notch: "This is not about creating a matriarchal system, but about recognizing the importance of women in the family structure." Or, by now and in this case, the political one.